The passionate self-surrender of the individual soul is alike the highest form of renunciation and of realisation and is termed bhakti amongst us, in India. Its significance, although perceived from time to time by evolved souls all over the world in Western as well as in Eastern countries, has not been fully understood by the sophisticated men of so-called "culture". It is nowhere better typified than in the life-story of the saint, Mirabai, who was the daughter of a 16th century Marwar King and who, almost from her childhood, adored with concentrated devotion the Divine Krishna in whose honour, as tradition has it, she composed unforgettable songs of love and surrender and with whom she was ultimately united. Her songs are part of the living heritage of India and her life, which has much more than a legendary import, demonstrates a national characteristic that has persisted through the ages. Even as early as the Vedas, we notice rites and prayers of devotees to invoke a certain form of Divinity taking His abode in an image. It does not really matter if superior persons brand this mode of approach as idolatry or superstition. The Indian technique rests upon the fundamentally true doctrine that one-pointed concentration in thought, speech, poetry, worship, song or action, always fulfils itself and that God responds and inhabits the place and form to which such concentration is directed. Any wooden or stone image, tree or living object is fulfilled, from the point of view of the worshipper, with His personality and the Supreme Being is regarded as acting from within the image. A European scholar Dr. Betty Heimann, endowed with a rare perception, has rightly apprehended the idea underlying our bhakti. In her language, "not only man but animal, plant and stone are imbued with universal life-force. A second animation is provided by concentrated thought and action of the sculptor. A third animation takes place by the concentrated thought of the priest by chants of invitation and welcome for the Deity. A fourth animation follows when the Divine responds to the call and takes His seat in the image. The veneration of the devotee adds to the life of the symbol and revitalises it. The image therefore embodies an intensity of power drawn from various sources". This is why it is believed that while, on the one hand, even certain deserted or dilapidated temples possess what is called sannidhyam (the living presence of spiritual essence), on the other, certain temples of popular resort and storied history have, by reason of the lack of such concentrated veneration, or worse, by reason of foul thoughts and objectionable practices connected with the Institution, have ceased to give any impression if sanctity to the expectant worshipper. Sri Dilip Kumar Roy, the well-known musician, poet and devotee who has lived a full and variegated life and who has always sought the ideal and has been strong enough to renounce an ideal when it has ceased to be vital and adequate, has sought to express the secret of bhakti as expounded and lived by generations of sincere souls; and, in this play entitled The Beggar Princess which, in his literary career, follows a series of biographical portraits, poems and acutely sensed life-sketches of memorable persons, the author presents the drama of Mirabai's life and conflicts in a play which is not only a prose- poem but is, in truth, the biography of a questing soul. 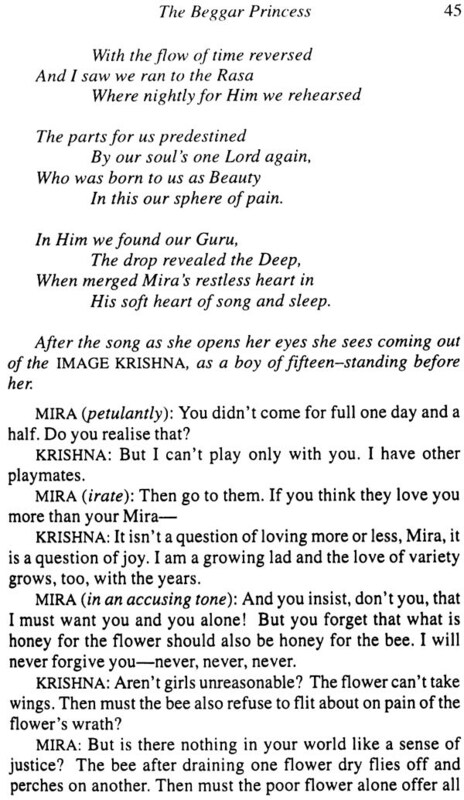 The Prologue opens in an ashram temple of Krishna in Kashmir. A young aspirant, Tapati, listening to her companion, Asit, singing a mystic song, goes into samadhi (trance) during which a woman in Rajput dress appears to her and arouses nameless yearnings, doubts and certitudes. Many years pass and Mira learns to meet Balgopal in vision and loving quarrels, in demands and reconciliation, in questions and responses. She tells Krishna that her father and aunts are calling her arakshaniyia and asserts that it is the sin to keep her at home unmarried. Krishna declines to advise her and tells her: "You cannot get to the top of the ladder at one bound; you have to go up rung by rung". Mira then asks if she should obey her father and get married. Bhojraj, the fiance, and Mira meet and in answer to Bhojraj's question "why turn your back finally on this our world for some thing which is too startling to be trustworthy if not actually too good to be true? Is it wise to bank on something so uncertain?" Mira answers: "I do not ache to be wise. I only hunger for one thing: to be true and loyal to my Gopal". 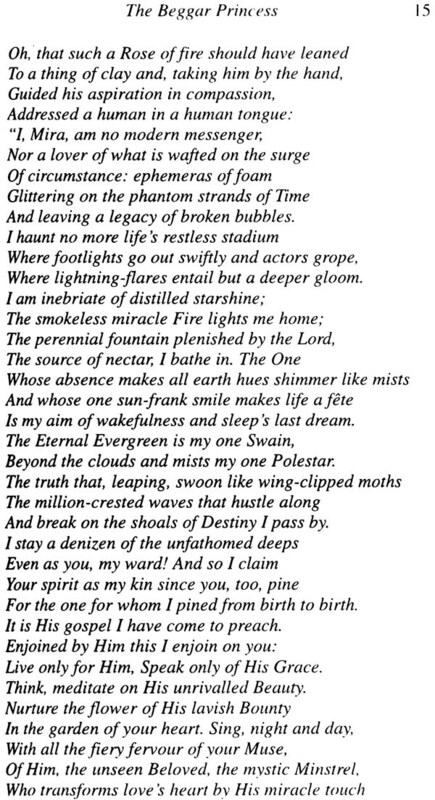 Finally, Bhojraj promises that he will cherish her and adds with worldly-wise confidence, that she is "a trifle non- human but nature is not mocked-it will assert itself." 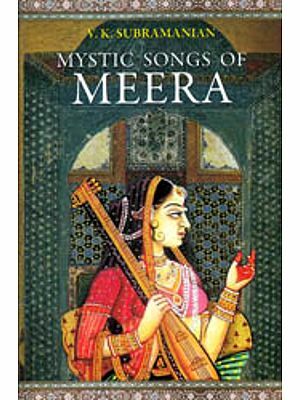 Thereafter, Ratan Singh, the father, recounts her story and says: "Mira is always asserting that the image comes to life day after day and teaches her beautiful songs and difficult rhythms in dancing". He adds that there could be no question of trickery because even when Mirabai was locked in her room, there was a Presence that appeared. At the end of all this colloquy Mira calls to Gopal, but this time there is no answer. She is baffled and confused and the marriage takes place with Bhojraj who is now the Maharana of Udaipur, the lovely city of lakes and royal castles. Mira builds for herself a private golden temple for Gopal where she continues to live her live of devotion, surrender and brahmacharya (continence). "The sister of Maharana comes to him and says that people are wagging their tongues about Mirabai because she spends most of her time in the temple neglecting her husband and her duties. His relations reproach and forsake him. 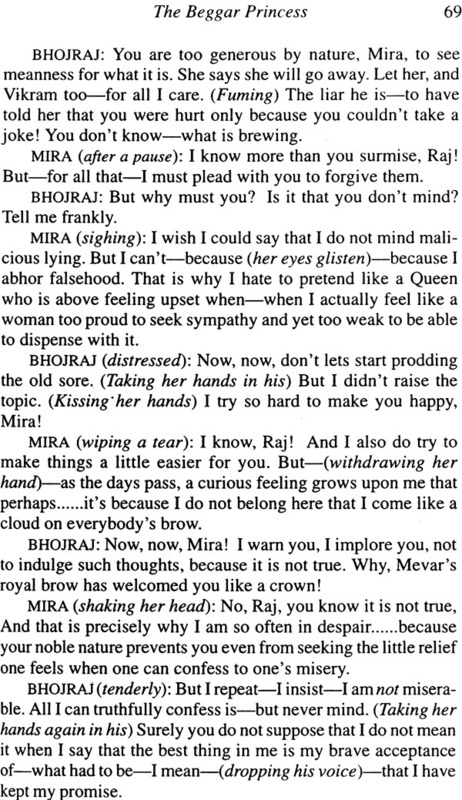 In perplexity and despair, Bhojraj approaches Mira. He has kept his promise not to insist in his rights as a husband, realises that she has shed glory on the throne of Mewar (her songs are now sung in every house), but still asks her to accept him with all his limitations although he knows that she is born in the world but yet not part of it. "There are episodes, both pleasant and unpleasant, and of gossips in the palace; but special mention must be made of a marvellous scene when Tansen, the great musician and Akbar's trusted friend, appears before Bhojraj and pays his homage to Mirabai. He says: 'I wonder if what commonly passes for Art is inspired so much by the deeper urge to perfection as by the cheap desire to catch the fancy of the common man. Technique is flaunted to win praise. It can only spring from tapasya.' Mira sings one of her own compositions and then dances in an ecstatic trance. Tansen departs after saying that he was born in India and has become a Musalman but Akbar has made him see that he is a false Muslim who respects another's faith less than his own. Tansen leaves after getting Mira's blessings, fully resolved to bring about an interview between Mira and Akbar, his master. "Bhojraj dies on the battle-field and his brother, Vikram, is installed in his place as the King. His sister and courtiers protest against Mirabai's dancing and singing in the temple even after her husband's death and they make uncharitable remarks about her not discarding her golden bangles and still retaining the vermilion mark on the forehead. The sister asserts that she can prove Mira to be an unchaste woman. Just at this juncture, Akbar, desirous of seeing Mirabai, appears in the temple with Tansen, disguised as a Hindu priest. He says: 'Maharani, I came here expecting to see a devotee, but I have glimpsed something greater: a Seer.' He then makes an offering of a precious chaplet which Mira places on the head of Gopal. 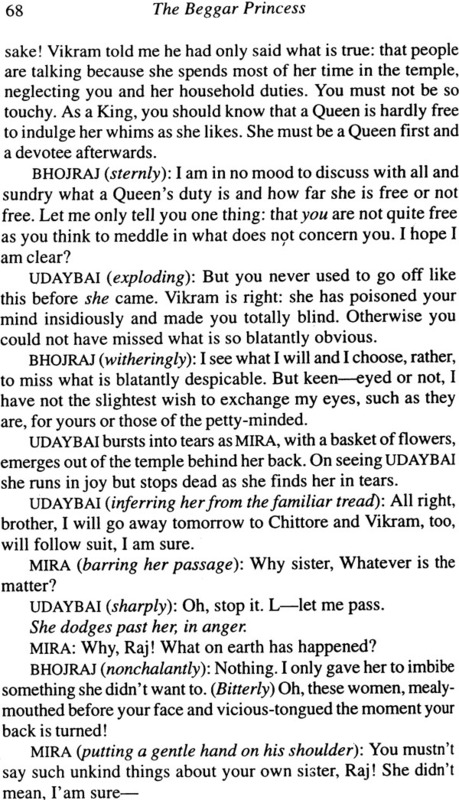 Just then, Vikram bursts into the temple and he and his sister, Udaybai, upbraid Mira and point out that the chaplet is of a Muslim craftsmanship and that Mira is masking her sin with her seeming innocence. Madan, the temple-priest, comes on the scene and reveals that Akbar had been in the temple. Vikram is infuriated and shouts that since a Muslim came to defile the sacred temple, therefore Mirabai must have invited him clandestinely. Then he insists on her taking poison, but 10, the cup of poison when drunk by her becomes inoperative: the image is seen to tremble and turn into a blue-black colour like a human being imbibing poison. When Madan witnesses the miracle and repents and asks for pardon, Mira says: 'Gopal has told me that there is nothing a man can do which cannot be absolved through repentance and surrender.’ Then Mirabai leaves Udaipur and becomes a wandering minstrel. If, as even such an astute historiographer as Toynbee admits, "religion, after all, is the serious business of the human race", adventures in the inner realm can hardly be treated with polite indifference or crude denial. After a long wandering in "the Valley of False Glimmer" and the casuistries of an impoverished Reality, eyes are once more turning towards the Real. The attempt is as yet incipient. Of this the revival of the poetic drama is a symptom. Values must be dramatised if they are to be effective. Dilip Kumar's latest play, The Beggar Princess, brings new hope, both in the manner of its inspiration and of execution. It sums up a whole career and will surely provoke admiration no less than criticism-perhaps that will be the measure of its impact. The world shows many examples of fiery and tortured aspirants, the via dolorosa has been trodden by many a pilgrim soul. But in sheer sweetness, in the accent of pure abandon Mirabai has few equals. Here is a name sacred to legend as well as to religious history-the history of man's real becoming, his quenchless thirst for the Divine. It is an inner world, of motives which elude l' homme moyen sensuel. But a sound popular tradition has kept alive the memory of this Bride of Krishna and her passion. 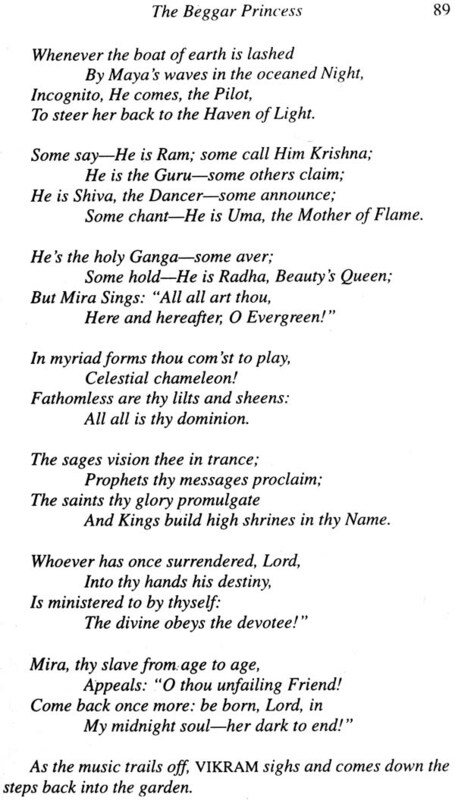 If for nothing else, Mira's songs (bhajans) alone make her immortal. But she is not only literary but also spiritual classic, and the story of her life is no less interesting and not without its lesson for Our age. To deny God and Love, to refuse the inner law of sacrifice is a costly error, and may prove to be a deadly one. 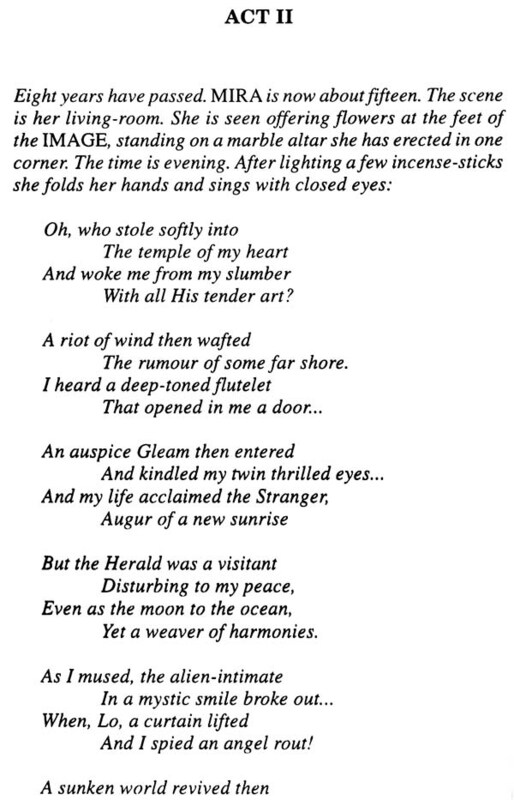 Mira, her life and her songs are an antidote to the prevailing poison. 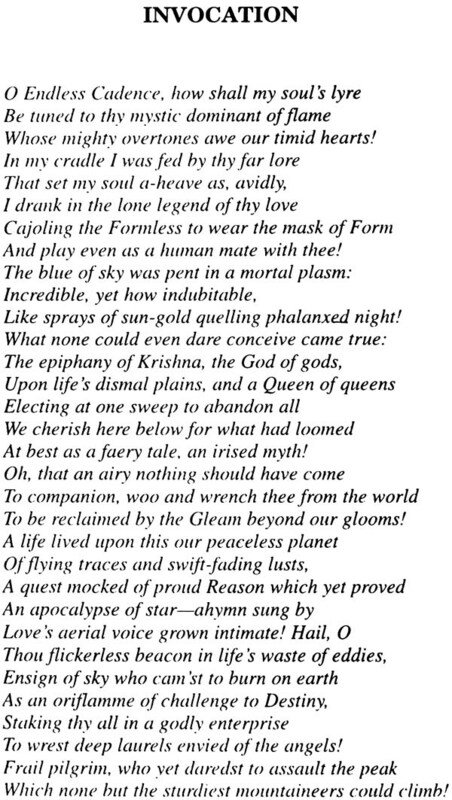 The spectacular figure of a great Queen relinquishing her all to find her One Lord; who was forced to drink poison and yet survived; a shy poet who was canonised in her life-time; a wandering minstrel who left not a disciple behind and yet still reigns over the hearts of mil I ions; one whose songs are a sublime expression of the supreme secret of Krishna's teaching-how shall reason probe into these mysteries? Our dramatist lays no claim to solve these mysteries either for himself or for others. All that he knows is that she has inspired him, from his very boyhood, as no other devotee of the Lord has ever done. And as one who has received unaccountable help from that celestial nourishment, he naturally wishes to share his gain and gratitude with others. This is a play, but a play with a difference. Like other spiritual figures from the past-but a past that lives in the present always renewable, as Dilip Kumar quietly insists-Mira escapes the categories of piecemeal analysis. In love has she flowered, in love must we feel her fragrance. After all the play's the thing. The shifting pictures are intensely human and we can only marvel at the ease with which passion and playfulness, debate, medievalism and modernity flit across the stage. The task is not without its dangers. For writers will claim continuous inspiration for themselves. For though the experience may, in a general way, antedate the act of writing, it is latter that must recreate the experience for us. It is not enough to be a devotee, one has also to be an artist. Fortunately, our author is both. He cannot only see but show, not only feel himself but make others feel. In lesser hands such an attempt might have floundered on the rocks. For in efforts like this, probability is often at a discount, or else the imagination becomes too literal; the descent from the sublime to the ridiculous is perilously easy. The difficulty increases when different levels not only exist simultaneously but, as here, interpenetrate. It is doubly difficult when we have no homogenous audience and the language used, as here, has been but rarely used for such purposes. From this point of view, the songs included in the play deserves more than a passing mention. Considering the difficulties, the play is a triumph for both art and faith. 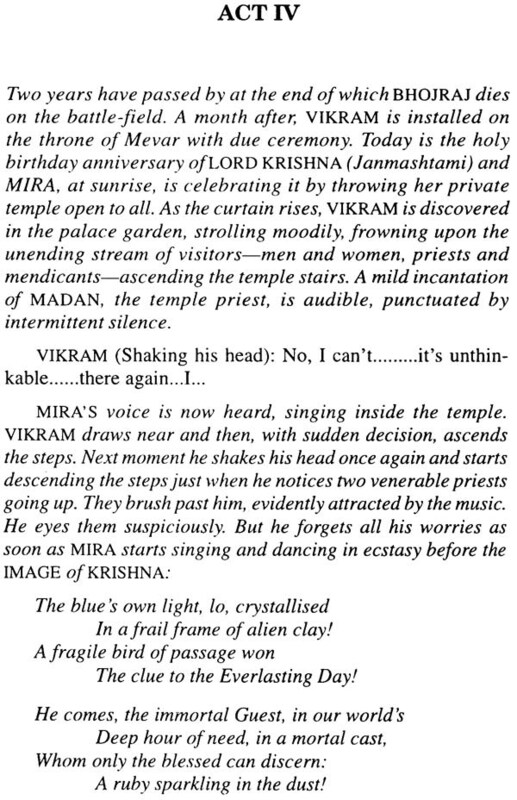 Of course it is not just a historical play, the Arcadian dream of some lost Vrindaban. And though we must not seek for a moral, one of its important implications is. I believe, that the play is being re-enacted. For it does not end when the curtain falls; it begins to live anew and we re-interpret what has gone before in present terms. This reliving of the original experience can have an enormous consequence not only for one individual, or for a handful, but for all who are ready for the Call. Perhaps a new conversion is at hand. The Beggar Princess operates on two stages-the inner and the outer. The present moment is a point of intersection between what-has-been and may-again-be. It is, therefore, a play in a double sense. To show it thus is, perhaps, Dilip Kumar's central effort and achievement. To see it thus, once on both levels, will be, for us, real understanding.